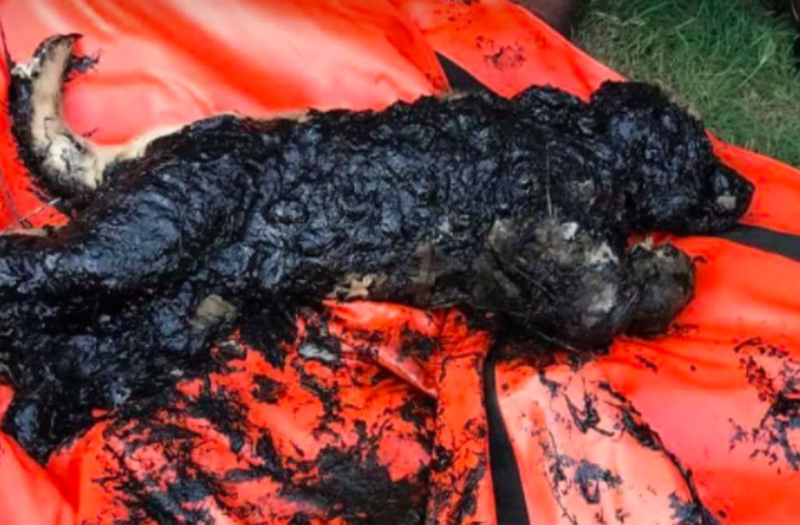 A tar-covered dog was discovered stuck to the ground after some of the substance leaked from a container. Luckily, Mike Frazier was walking by a barn in Yazoo County, Miss., when he noticed the pup lying on his side in the sticky mess. Frazier called FLY Rescue, and representatives from the organization then began the exhausting task of removing the disgusting goo. "He was embedded in tar, it was up under the center of that tar tank," Frazier told WLOX. "And it was caked in tar about 2 to 3 inches thick." The dog was transported to the Animal Medical Center, where he was sedated to calm him down and covered in coconut oil to loosen the tar. "It's tedious, and we can only do it while he is sedated," FLY Rescue said on its Facebook page, where it was posting updates on the clean-up process. "He will be mostly bald once it's all removed." FLY Rescue said that Warrior has received an outpouring of support, so it won't be hard to find him a home when the time comes.